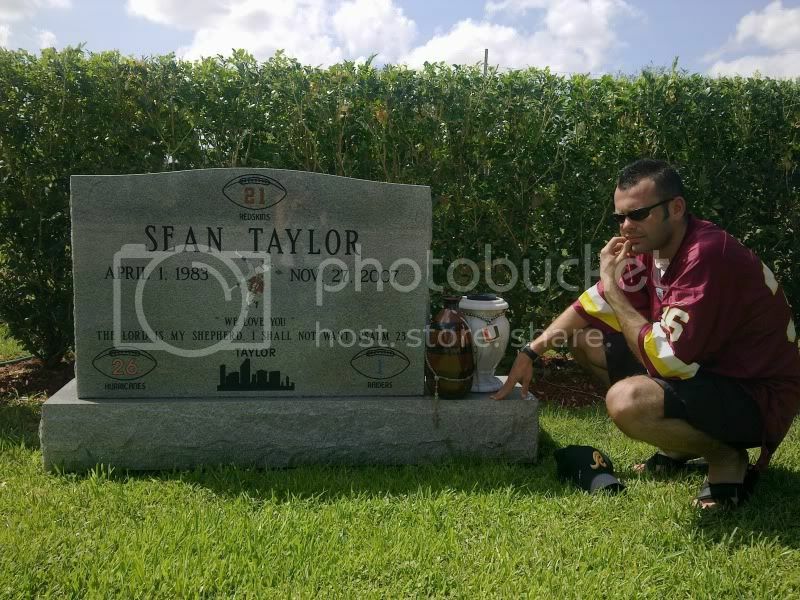 I know as Redskins fans, you guys understand the deep sense of loss we had when Sean passed. He wasn't a close friend, a family member, or partner...but he was a Redskin. He was a son. He was a husband. He was a father. He made his presence felt in his short time on earth, and indeed his short time with the team. We will never forget him. On a recent vacation to Florida, we spent a few days in Miami before heading to Marco Island and then Key West. Knowing Sean was buried in the Miami area, I decided that I would look up the burial site. All I wanted to do was say a few words, pay my respects, and get a picture so I could show you guys and my father, also a big fan, how Sean is honored at his burial site. I don't know how many of you have been fortunate enough to go down there, but for those who can't or may never be able to, I figured you may appreciate a picture. Personally, I think the headstone is very tasteful - honors all the major teams he's played for, isn't elaborate in any way, just a simple memorial to a much-loved and sorely-missed man. I admire you for going there Laim, it must have been very hard. Thanks for repping us. Thanks for posting the pictures. 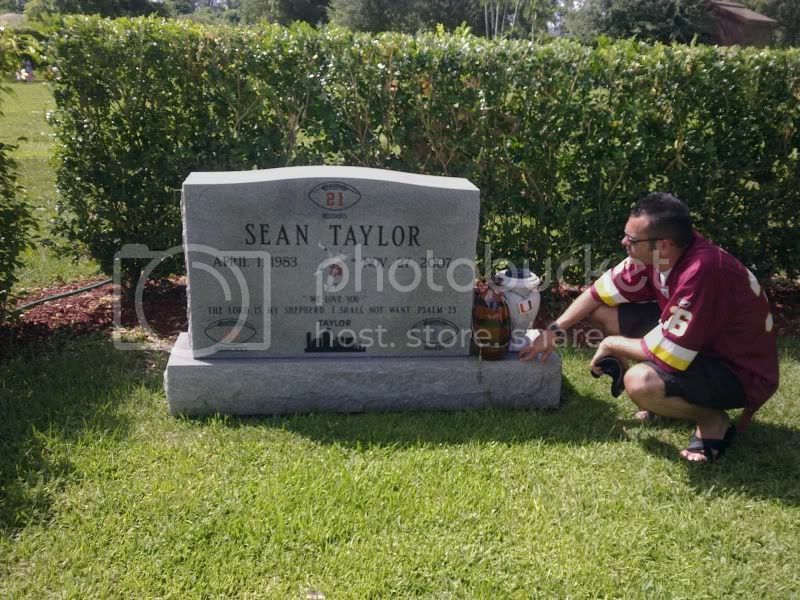 Sean Taylor will never be forgotten. Thanks for the photos Liam and thanks for sharing them. Sean was a special man to many people for many reasons. 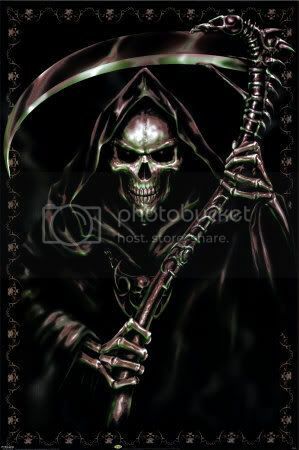 May he rest in peace. I will never forget him, ever. He was an amazing player and by every account an amazing person. Not sure if you can pick it out or not, but that's a Dallas player he's hitting in the decoration. Nice touch, I thought. I still don't watch a Redskins game without thinking about ST. Someone mocked me for saying that at the old board, but hey, it's true. Visiting his grave....man....just the pics sent chills up my spine. Must have been very surreal. Thanks for that Liam. 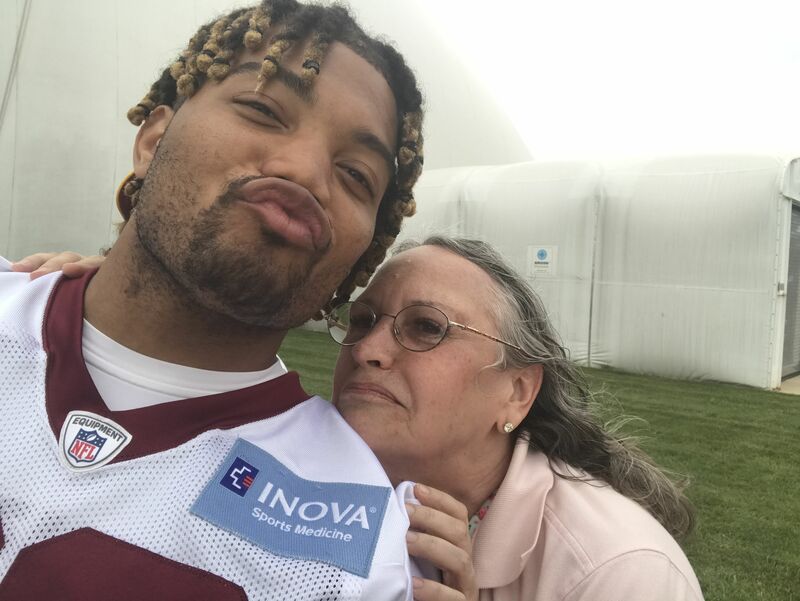 ST36 - as I will always know him - was my favourite Redskin of the more recent teams. There was something about him, an aura, that you just knew he was going to be a great player in this league if he had got the chance. I'm just glad I got to see him play in person and was able to marvel at the skills of the man up close. Its all good. That did sadden me that he was trying to protect himself and his woman with a machete I believe, when two scumbags gunned him down. He was so young. Nice post....ST was one of the greatest athletes i've ever seen put on a football uniform. The guy had the tools to play multiple positions. What a talent...what a man. You are, and forever will be missed ST!! Sean was totally different than the picture the press painted of him. 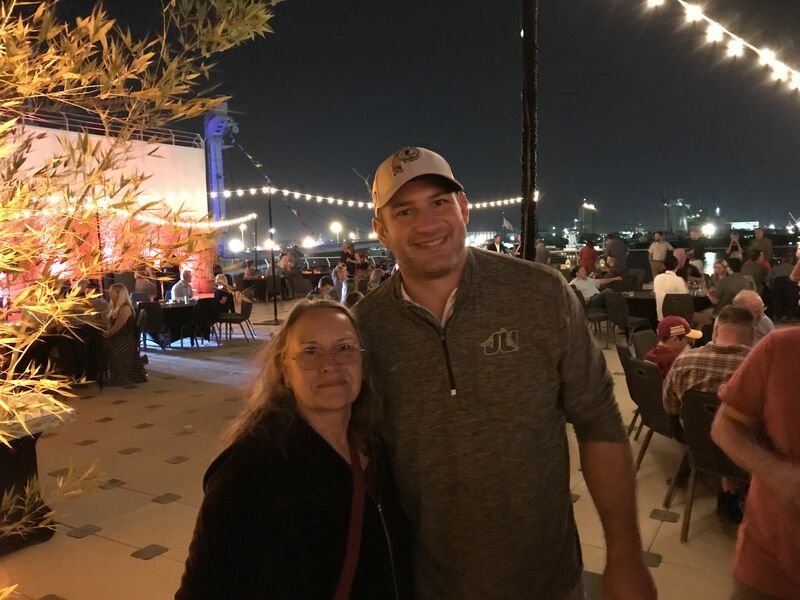 He was gentle, humble, open to fans, and quite a gentleman in person. He once told me he didn't he didn't "deserve to sign my name next to Gary Clark's." RIP Sean, you give currency to the adage only the good die young. 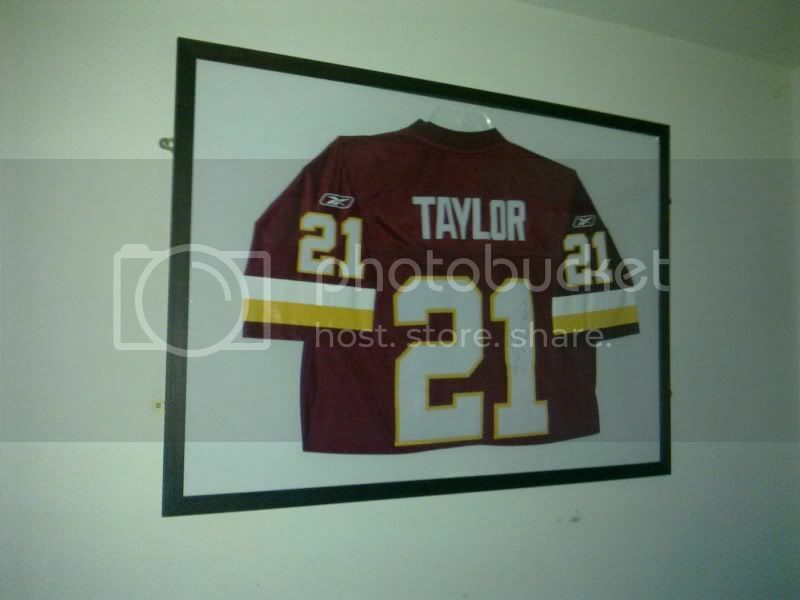 I have to say that Sean Taylor's jersey is the only one I ever purchased. I have few but they were gifts. I bought it 3 weeks after we drafted him and gave it to my Mom. She was just getting back into watching the Skins because Joe Gibbs was back. I said to her "Mom, I'm giving you this jersey because you are watching the games again. And I'm giving you Taylors because he will be easy for you to find. He will be everywhere." "And I'm giving you Taylors because he will be easy for you to find. He will be everywhere." I think that is the most beautiful tribute ever written for him ssb. Thank you very much. Still don't know 100% why I had such a feeling. 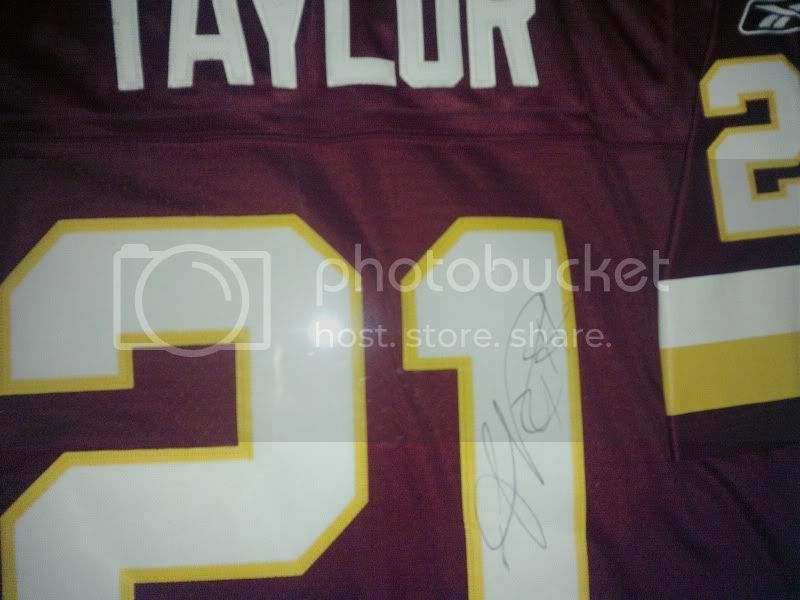 ssb, Sean Taylor's rookie jersey is the only one I own - and that was a gift to me from Pun. I wear it very rarely because of the respect I have for the man - as a person and football player (and because it came from Pun its special also). Every time I look at it or put it on, its reminds me of how great Sean was going to be and, despite how brief his career was, the joy he gave me while on the field. Wow, that is an amazingly special jersey.